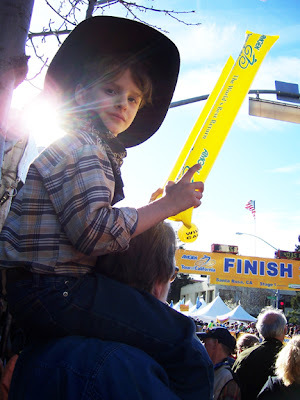 #1 son on Dad's shoulders getting the best view of the finish line. 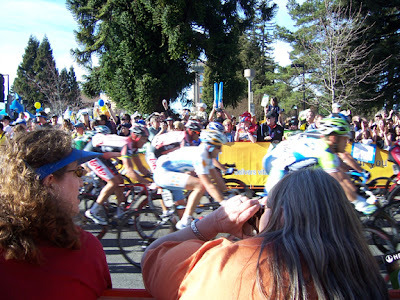 The first of three laps around Santa Rosa. 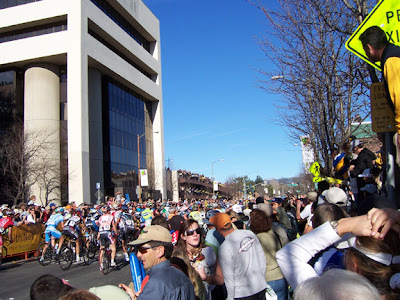 The back end of The Big Pile-Up in which half of the peloton was caught or went down. My husband saw the whole thing happen, but, alas, I am vertically challenged, so only saw half of it. I was holding the camera up over everyone's heads to get the pictures! 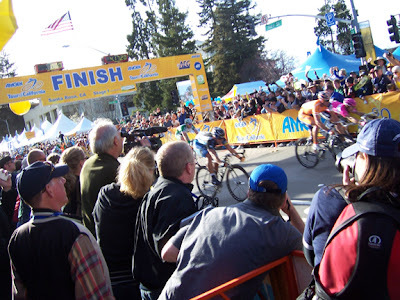 The finish! It was awesome. That looks like a fun event to watch. T. is a bike racer so these are all being TiVoed right now. A few weeks ago he actually rode with the Navigator team! Gah, that's a lot of people! Looks exciting! Can't wait to see the shawl. How exciting!! we were just watching a little bit of it on TV last night but didn't see the end.